MARINE CORPS BASE CAMP LEJEUNE, N. C. -- Marines with 2nd Amphibious Assault Battalion endured the rough ocean waves as they conducted a series of amphibious operations during a training exercise at Camp Lejeune, North Carolina, May 31 – June 2. The training allowed Marines to gain more experience conducting combat-oriented amphibious operations in preparation for an upcoming large-scale training exercise known as Integrated Training Exercise later this year. 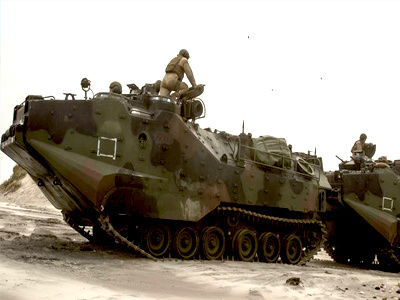 The unit performs amphibious operations training frequently, however, there are still a number of challenges the Marines can face while training. A secondary intent of this training exercise was to allow junior Marines to hone the skills necessary to complete any amphibious mission that they may receive in the future. The senior Marines shared knowledge with the newer Marines, showing them better ways to operate. Now, the junior Marines are a lot more comfortable and familiar with what they need to do, explained Khors. With a wide range of capabilities, 2nd AAB plays a critical role in completing the mission of the Marine Corps.